When friends come to visit from the west after dark, via Interstate 64, passing by the old Ashland Oil Refinery (now Marathon), they describe their first impression of the area, as they whiz by the flaming towers and stacks, as arriving in the belly of Hell. For decades, when Armco Steel dumped load after load of slag downriver from Huntington, the night sky, especially if overcast, would glow with a pulsing redness, as if it were on fire. This is my hometown, a place of dark energy, established eleven years after West Virginia separated itself, in 1860, from Virginia, the premier state of the Confederate South. Huntington was founded as the western terminus of the C&O Railroad. According to the 2010 census, Huntington has the largest metropolitan area in the state. The Greater Huntington metro area extends seven counties across three states with a population of 364,101. 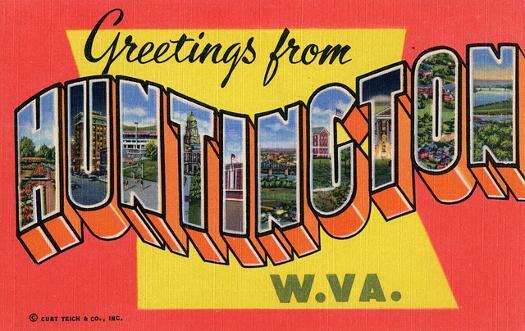 All but the first three of my sixty-seven years have been lived in or around Huntington, West Virginia. I love it here. Having grown up poor, I’ve lived in rented houses in most of the neighborhoods of both the east and west ends of town. I have written poems and stories set on every other avenue and alley. On any evening walk, it takes little imagination to see myself running across a given street or biking down an alley. As in almost anyone’s hometown, this one is full of the magical memories of youth and the ghosts of self. Yearly, we have an average of forty-nine sunny days. A typical day here, even in bright summer, the sky is that misty shade of the milk glass pitcher and bowl sitting in windows and on sideboards in old neighborhood houses. Most of our sunlight diffuses through a layer of clouds daily. The hills hold morning fog among trees until afternoon when cumulative heat may burn it off. There are a few hours some mornings when the river has neither stench nor scent, and the air is free and moving. Real darkness dwells here. Many is the day that my photo-sensitive night light, plugged-in a few feet from a tall kitchen window, facing east, burns all day. Some evenings when a sudden breeze and light rain distill dust out of the atmosphere, a deep and easy breath may be had; otherwise, poor air quality is noted by each new émigré and asthma sufferer. Those who have never had allergies often develop them shortly after relocating here. Over the town and the valley, the ozone layer has been eroded near to nothing by the multitude of chemical, steel, and other factories that once lined the river. We even have our own type of eye cancer due to that erosion. The Center for Disease Control puts the cancer rate for the area as one of the highest in the country. Everyone in my family who worked in such factories and coalmines has died of lung and bone cancer or black lung and emphysema. Like Tolkien’s dark land of evil, a foul energy dwells here, an energy that holds and won’t let go. It is negative and steel-like in its resistance to change and innovation. It is the rigid force of abusive, long-term poverty beside the stale inertia and self-protection of old money. In lighter moments, I ascribe it to Chief Cornstalk’s Curse. At the end of Lord Dunmore’s War, 1774, after the Battle of Point Pleasant between the British colonial militia of Virginia, and the Shawnee and Mingo American Indian nations, Shawnee Chief Cornstalk pronounced a curse on Lord Dunmore and all his progeny for their loss in the war and the loss of all hunting grounds south of the Ohio River. Though that curse was pronounced miles up river in Point Pleasant, I sometimes can’t help but feel that dark energy has drifted down the Ohio to the Huntington area. This past winter (February, 2014) tanks at Freedom Industries on the Elk River in Kanawha County, West Virginia, leaked MCHM, a highly toxic chemical used in the coal industry, into that river, thence into the Kanawha and the Ohio Rivers. Several towns along this route closed their water intakes before the chemical could get into the water lines and systems of the towns. Huntington officials refused to close intakes, stating that the system was so old, it would cause damage to it and cost too much to repair. Dark energy. Now, five months later, at the time of this writing, we still have no clear reports as to the safety of our local water. Thus, many of us will be drinking bottled water with all its vague uncertainties of safety, instead of the local water with its more definite uncertainties, for some time to come. It takes real courage to live in an area like this one. Writers, painters, actors, artisans, musicians, and inventors live in every neighborhood and along every holler on both sides of the river. It is no secret that a few years ago a poll by USA Today found Huntington to be the “Unhappiest City in the US.” Later in a similar poll by the same tabloid, Huntington was determined to be the “Fattest City,” per capita, in the nation. Most recently, Huntington was chosen the “Most Miserable City” in the country via a 2014 Yahoo poll. Despite such dismal pronouncements on the part of outsiders and despite the neglect of our own officials and citizenry, Huntington, as well as the surrounding area, has some of the smartest, most talented people I’ve ever met—and that includes folks I’ve met all over this country, Europe and Canada. It takes real courage to live in an area like this one. Writers, painters, actors, artisans, musicians, and inventors live in every neighborhood and along every holler on both sides of the river. When friends come in from the outside world, they will often comment on how lacking in sunlight, how rainy, how hot and humid, or how cold it is here. Contrastingly, in spring Huntington is one of the most colorful and clean-smelling towns around. In autumn, likewise, it has a fecund quality that seems pure and pristine. The explosion of spring blossoms and colorful displays of autumn leaves in our city-long public park account for much of this. Almost every street in the city is tree-lined. The Wayne National Forest begins across the river, north of the city, and the tree-dense Appalachian foothills rise to the south. Buildings, on the other hand, are anciently rundown or peculiarly new. Factories are mostly museums of rusting tanks, pipes, and armatures. Residential areas are crumbling: Victorian mansions, stiflingly close working-class tract houses, or lop-sided shotgun homes. Nowadays, to add to the atmosphere of darkness, Huntington has a severe drug problem. Heroin is as common here as marijuana is in other towns. DEA agents and drug dealers refer to Huntington as Moneyngton to indicate that though the mean annual income per individual may be less than $18,000, we will spend our last welfare dime to get a regular fix. It should be no surprise then that something in me wants to remember the town as it was in my youth of the 1950s and early ‘60s, when our main vices were schoolyard fights and car theft joyrides. Back then there were more than a few colorful characters around town and several amusing houses and buildings. Pushcart Pete was a lanky fellow wearing an old fedora who pulled a heavy wooden cart about town as if his mule had died. He picked up junk in alleys. He was such an anachronism, it was a treat to see him plodding along salvaging discarded metals from trash piles and bins to turn in for cash. Socksy was a short Jewish fellow who sold socks out of bundles he carried on his back. Legend had it that he had survived a WWII Nazi concentration camp. I bought a pair of his wares once. The seam ran lengthwise down the middle, instead of across the toes, of each sock. Trailer Tramp, a large bouncy lady, who always wore cowboy get up—hat, boots, shirt and big belt buckle—looked like an escapee from a rodeo. As a kid, I was warned to watch out for her. It was said she hung out in the town’s three cinemas pestering little boys. I never saw any proof of this on the several occasions our paths crossed on the way to the theaters’ candy counters. Two especially amusing buildings were located on Fourth Avenue. Ward’s Donuts, home of the lightest glazed donut in the world, sat directly across the avenue from “The Monkey House,” as I called it. Its front and side yards were filled with monkey sounds and long chains padlocked to trees. These chains collared the necks of rhesus and spider monkeys. Each chain ran through a heavy cement block to keep the respective monkey from running free or climbing too high in the bare trees on the property. Once in a while, a monkey would escape, and the family living there had to pay a fine for having had “wild animals” within city limits in the first place. Again and again, the city tried to force the monkey house family to get rid of their front yard zoo but somehow failed. I once lived two blocks over at Fourteenth Street and Sixth Avenue. About four o’clock each morning, the donut chef at Ward’s Donuts would bring out a new batch of the softest, lightest sugar-glazed donuts I’ve ever eaten. Everybody loved Ward’s Donuts. Their chocolate-coated glazed donuts were lethal, too. I knew diabetics who’d load up on insulin some mornings just to have a few Ward’s pastries and a cup of their deep black coffee. I loved to come out hours before school, walk down to Fourth, my ear cocked to hear the first screeches from the monkey house and my nose anticipating the aroma of fresh donuts. I was too early and too young to be let in, but I was, nonetheless. About five a.m. I’d get there to play one of the two pinball machines, have a cup of the starkest, strongest coffee ever, smell the donuts cooking and wait for them to be rolled out on tall racks. It might not be light yet. Only the occasional car passing in summer-stiff air, autumn coolness, or spring breeze— I don’t remember ever being there in winter— but the monkeys across the street would be up and picking nits from each other or fighting over bananas and oranges from the buckets in the yard. Not much like Mordor, I’ll grant, but even the land of dark power had its lovely cubbyholes where the loathsome denizens could hunker and delight in being where they understood what life was about, or about to become. While we were getting fat, diabetic, and jumpy, the bright, outside world had its bagels, yogurt, and some of what the monkeys pulled from the galvanized buckets for breakfast across the street. The Monkey House disappeared first. The yard was just bereft chains and trees after a third instance of a monkey biting a passerby who teased it through the sidewalk fence. The Ward’s Donuts building is now an Italian deli and carryout. The remaining round donut sign and the wide front window awnings bear the only resemblances to the old shop. Some of us don’t seem to have been cut from the same autochthonous cloth; yet many of us do have some of the telltale, stereotypical marks of Appalachian poverty: poor overall health, lousy orthodontia, lack of sophistication, and a distrust of outsiders. Some of us don’t have life-long friends, close family, and distant relatives everywhere around the tri-city, tri-state area which includes Ashland, Kentucky and Ironton, Ohio. Some of us don’t seem to have been cut from the same autochthonous cloth; yet many of us do have some of the telltale, stereotypical marks of Appalachian poverty: poor overall health, lousy orthodontia, lack of sophistication, and a distrust of outsiders. Not all tribal effects being good ones, we are too accustomed to being ripped off by northern and eastern wealthy land and business owners. But it is in the unvarnished, open personalities and love of nature and place of so many here that form the mainstays of my love of this area and of Appalachia in general. To be able to step out your door and know that almost everybody around knows you and your family is secure and comforting knowledge. The drawback of this is the obvious inertia that accompanies thoughts of relocating for more money to a place where no one knows you. How, then, is this small area of Appalachia a hillbilly equivalent of Mordor, the dark land of the dark lord Sauron? Replace evil with anger; Sauron with Big Coal. I come from coalminers, farmers, and factory workers, but I still see coal and the interests of coal as mainly self-serving. Many of the people who are enslaved to it as a way of life have been for generations, much like the beings of Mordor held in darkness as of a mine, held in the thrall of a single way of life. And then there is Marshall University. I see this fine institution as apart from the area, much like Saruman, the White, was in the beginning before succumbing to Sauron. Saruman soon gave in to the greater force and ultimate evil of Sauron, even though his heart had once been in the right place. Saruman was a member of the same lodge as Gandalf. As Marshall’s heart was once that of a small town college, then a modest university serving up a liberal arts education, somewhat under priced for what it delivered, before becoming a growth-obsessed institution. In 1966 when I landed on campus fresh from one of the town’s two high schools, my tuition fee for a full load of semester classes could be covered by weekend pokers games. Like most college towns, Huntington seems to be a remnant town, a site of devastation or plague when the university is closed for any reason. Students from the hollers, hills, and other river towns go home, taking their infusion of energy and youth with them. Marshall would see itself as the town’s salvation, I’m all but certain. The sports program is always growing and remains famous in some quarters, due in part to the We Are Marshall film depicting the 1970 Marshall football team’s tragic plane crash. On the surface at least, Marshall seems bright and active. New buildings for science, medicine, and athletic departments are always being built. It may seem like reductionism to point out that science and medicine train people to leave the area to ply their new training elsewhere, and that athletics is largely a diversion. The campus appears likely to take over any area of town it might want. But, the graduation rate remains far below the national average, especially for student athletes. Professors’ salaries, too, are lower than many other universities and, in some cases, lower than public school teachers’ incomes in small school districts in nearby southern and central Ohio. The university, like many in the nation, is in transformation from a liberal arts school to a research and tech institute, and that means more jobs and more training—for those willing to leave the area. Granted, things have changed a bit in the last few decades. Willie Nelson, Bob Dylan, and others do come to town to give sold out performances at the Big Sandy Civic Arena. Sorry, but These occasions only remind me that such things must be imported. The way so many Scots-Irish and Welsh left the coalmine towns of the British Isles to come to another green and hilly land to go back into mines during the second and third waves of immigration to the New World, is not unlike the draw of Mordor on those it ultimately enslaves. With the appearance of Pullman Square, a complex of theaters, shops, restaurants, and a performance stage for local and once-famous bands, Huntington on certain holidays has some of the thriving aspect— however short-lived and artificial— of the old riverboat and railroad atmosphere of its early days in the time of founder, and robber baron, Collis P. Huntington. Sadly, the vast majority of profits for this Pullman Square endeavor go back to the investors in Columbus, Ohio, the locals gleaning little more than the minimum wage benefits of ticket sellers, shop clerks, and security officers. The way so many Scots-Irish and Welsh left the coalmine towns of the British Isles to come to another green and hilly land to go back into mines, during the second and third waves of immigration to the New World, is not unlike the draw of Mordor on those it ultimately enslaves. Each being of Mordor had no sense of a different sort of living thing outside the confines of the land of darkness, except as a thing to be conquered for the Lord of Mordor. After generations and generations of living there, what hope did an orc or goblin have of becoming anything else or of escaping the Mines of Moria? How hard is it to shake off such inheritance? I think it will take the death of Big Coal, at last, to break the connection, like throwing the One Ring back into the fires of Mount Doom, from whence it came. Then after some generations, here in Hillbilly Mordor, a sense of our own worth, having been eroded almost two centuries in a dark land serving a dark lord, may be restored. Ron Houchin’s most recent poetry collection, The Man Who Saws Us in Half, recently won the Weatherford Prize. He is a frequent contributor to Still: The Journal, beginning with our inaugural issue in 2009.